Suprematism is the painting of light, and light is made up of colours. Suprematism originated in 1915 out of theories of the colours as they are seen by the human eye, the colours of optical light. Kazimir Malevich called it “Suprematism”, a word derived from the Polish that means “dominant” – colour is dominant in the eye and, hence, on the canvas. There are several phases in the development of Suprematism between 1915 and 1920. In all of them, light was the subject matter but Malevich discovered several ways of exploring it. In 1915, Suprematist paintings were images of the optical colours of light. They were titled Pictorial Masses at Rest, and Pictorial Masses in Movement. Malevich was composing with optical light and after-images. In 1916, Malevich began to use spinning discs in order to discover the phenomenon of light in centrifugal movement. In 1917 he engaged in his “research into colour”, as he described it in his essay to SUPREMATISM 34 DRAWINGS (published in 1920), and this was achieved by the use of light projectors using colour beams and rays. Malevich was composing with light. In 1918 colour began to disappear in his projected beams of White on White paintings. Malevich was composing with pure white light. Malevich first exhibited a large group of 39 paintings, Suprematism, at the Last Futurist Exhibition of Paintings 0.10, in Petrograd in December 1915. They were divided into two main groups: Pictorial Masses at Rest, and Pictorial Masses in Movement. The “pictorial masses” originated as optical masses of colour in the eye’s visual field when stimulated by light. They were “at rest” when the artist’s eye had focused on a colour and captured it alone. The masses were “in movement” when the artist moved his eyes causing changes in the colours both in shape and in colour as the after images shifted. Five years later he had a one-man show in Moscow which opened in March 1920, titled: Kazimir Malevich – His Path from Impressionism to Suprematism. There he showed the full range of his figurative and Cubo-Futurist painting from c. 1906, and his Suprematism from 1915 to 1920. Of the latter can be seen his White on White canvases capturing pure white light, but his innovations of 1917 and 1918 are known only from a very few paintings and descriptions of others – Malevich’s compositions using light projectors are very little known. It seems to have been Olga Rozanova who first began working with light projectors in 1915 but she did not exhibit them at the 0.10 show. After that she became an extremely inventive Suprematist painter. Ivan Kliun had been engaged with Futurist works in the summer of 1915 which he spent with Malevich at his country house at the time he was inventing Suprematism. Kliun’s own Suprematism began in 1916 and he, too, was soon composing with beams of light from projectors. Following the 0.10 show, where other painters had shown their Cubist and Cubo-Futurist paintings, they became engaged with the principles of optical colours in light and formed the Supremus Society of Artists in late 1916. They then exhibited their Suprematist works at the 1916 Knave of Diamond exhibition, Malevich showing 60 paintings titled, “Suprematism of Painting”, while Alexandra Exter, Ivan Kliun, Liubov Popova, Ivan Puni, Olga Rozanova and Nadezhda Udaltsova also showed non-objective works. At the 1917 Knave of Diamonds it was Alexandra Exter who was given pride of place, while the critic, Abram Efros, wrote that the “last part of the exhibition consists of the group of Suprematists – Malevich, Kliun, Puni, Rozanova, Davydova and so forth. ‘Geometry in paints’ thrives here. Just like last year we have the same parallelograms, circles and triangles, painted in different colours and standing in spatial relationships to one another. The inventiveness is few and far between, the result of far-from-ingenious quests for the old alchemical stone – the notorious ‘pure painterliness’.” (Abram Efros, “Letters from Moscow”, Apollon, Nos. 8-10, pp. 109-111) The artists were painting light, being inspired by the use of projectors especially, and they called their works, “Colourpainting”. To translate the artists’ word, bezpredmetnost as “objectless”, a noun, is not appropriate because this is an attempt to define, by negation, the work of art simply as that which “has no object” and by implication that it therefore has no meaning. The use of “non-objective”, an adjective, on the other hand, implies that the work of art is made up of attributes, and in this case by qualities, specifically colour. “Objectless” declares what it is not, while “non-objective” says what it is: the art of colour – in light. Malevich was invited to teach at the Practical Art Institute in Vitebsk and he travelled there in November 1919 with El Lissitzky, who had extended the invitation on behalf of the director of the school, Marc Chagall. Around Malevich gathered a group of about 30 students by early 1920 (there were well over 100 students in the school), and Malevich’s teaching programme was based on the modern trends – Cézanne and Cubism, Van Gogh and Futurism, Suprematism and construction. Having mastered the creative principles of these trends, the students went on to work as architects and designers in Petrograd/Leningrad during the 1920s, creating furniture, porcelain, graphic design, as well as architecture. 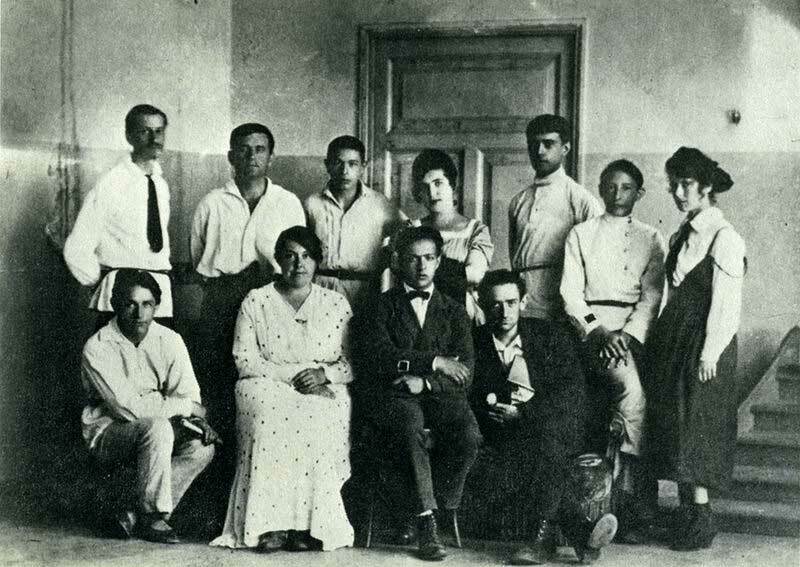 Diploma students (with two teachers) of the UNOVIS group of artists, Vitebsk, 1922. Seated left to right: M. Veksler, Vera Ermolaeva, Ilya Chasnik, Lazar Khidekel. Standing left to right: I. Chervinka, Kazimir Malevich, Y. Royak, Anna Kagan, N. Suetin, Lev Yudin, Evgenia Magaril. Patricia Railing, Malevich Paints – The Seeing Eye (2014). On the writings of Malevich see Kazimir Malevich, Malevich Writes (2014).